This summer I’ll be heading west to the farm every other week as part of a CSA (community supported agriculture) program at Stearns Farm, in Framingham, MA. Unlike the CSA boxes that end up on your doorstep, Stearns is a bit more hands on, and requires both regular work hours, and picking a good portion of your produce each pickup. It’s a way for me to avoid the supermarkets, eat in season, and (selfishly) farm without the larger commitment. 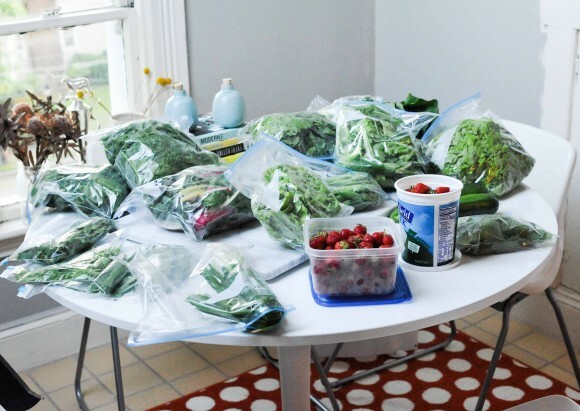 On CSA pickup day I try to clean my fridge and re-organize in advance so I’ll have space for my produce when I return. When heading to the farm, I bring large cooler bags, and a few assorted sizes of Ziplocks. I also bring a pair of scissors to cut herbs and certain vegetal leaves. I bring a sharpie to label my produce with a name and date picked. If produce can stay on the counters in a shady part of my kitchen, I’ll leave them out. 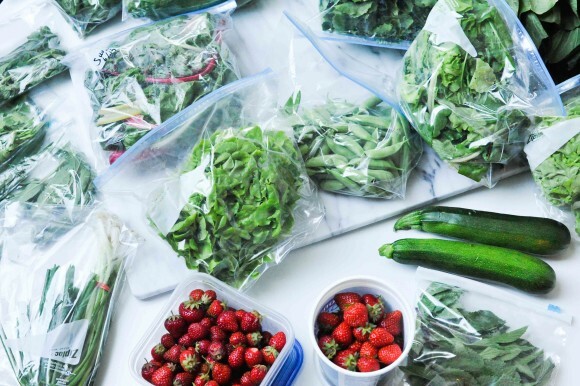 If I have no space, I’ll freeze leafy vegetables like spinach and chard to put in smoothies. So, what’s on the table? To pick: 1 quart snow peas, 1 quart snap peas, 10 stalks of swiss chard, 2 quarts of strawberries, and glean spinach which was going to seed. Herbs: sage, marjoram, garlic chives, and mint. Pre-picked: 1 lb. zucchini, a large head of escarole (or a kohlrabi), a huge bok choy, mustard greens, scallions, and three heads of lettuce. When dealing with my CSA vegetables, I like to have an arsenal of easy no-recipe meal ideas that use a lot of vegetables. Many of my go to meals are here. I also make a lot of stir fries, serve quick cooked vegetables with ground meat, mix vegetables with eggs, eat large salads, and break out my spiralizer to make vegetable noodles. My cookbook collection certainly helps with ideas – I have a good selection of vegetable based cookbooks which are organized by vegetable type. I also make good use of my Eat Your Books subscription. 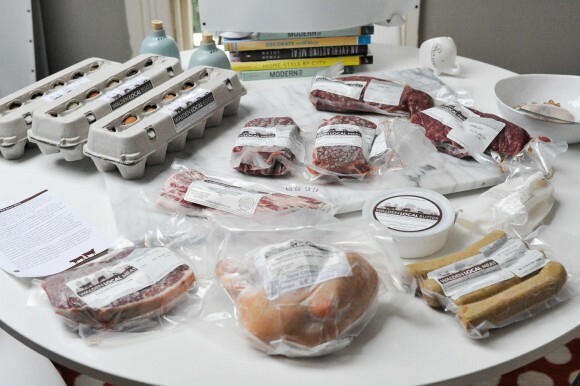 My Walden Meat share (pictured below) also helps me plan – I try to defrost a few meats in the fridge every week, and then build meals based on what I’ve pulled out to cook. Just a few of my meals this week – not all of these are exclusively with farm produce, but I prioritize what needs to be eaten quickly (lettuces), as well as any existing leftovers in the fridge. I’ll try to drop in notes over the course of the season so you can see what I’ll be doing with my produce. In the meantime, I’ve been sharing most of my meals here on Instagram lately. Take a look! Love this! We have a few PYO veggies at the farm where we have our CSA, plus herbs and flowers every week. 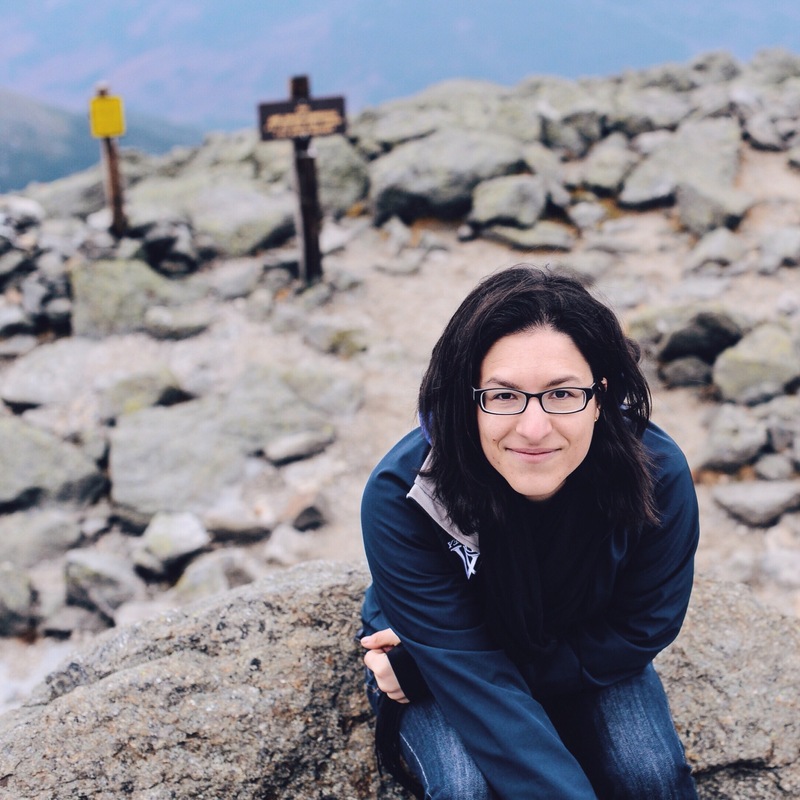 Last summer, I told myself every time that I was NOT GOING TO SPEND AN HOUR AT THE FARM — and every week, I gave in to the desire to wander in the fields, visit the sheep, and take my time picking fresh produce. It’s so soothing. Hope you don’t mind — I may steal your idea and share what’s in my haul this week. The variety is really busting out now.